New Delhi wants to seal the deal on Predator drones before Obama leaves office. Reuters’ Sanjeev Miglani and Rupam Jain had an interesting if not entirely unsurprising report out earlier this week on U.S.-India defense ties ahead of the U.S. election. New Delhi, they report, is trying to grease the wheels on concluding a deal with Washington for the transfer of U.S. 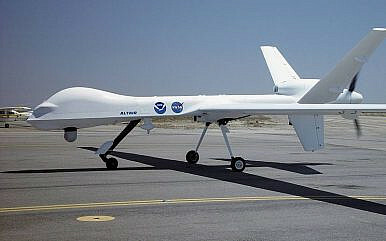 Predator surveillance drones. The deal is one of many issues under consideration between the two sides as defense and strategic ties have expanded considerably since Indian Prime Minister Narendra Modi came to the scene in mid-2014. India has requested 22 of the advanced U.S. surveillance drones, which will give the Indian Air Force an important surveillance capability, particularly in the increasingly tense Kashmiri environs where militants and cross-border infiltrators continue to pose problems. “It is progressing well. The aim is to complete the main process in the next few months,” one source tells Reuters regarding the status of the deal. Delhi is also interested in purchasing the armed Predator variant, but won’t be able to win approval under U.S. export control laws. India, like other U.S. partners and allies in the Asia-Pacific region, is concerned about the uncertainty posed by the U.S. election, which pits two candidates — Hillary Clinton and Donald Trump — who vary considerably on foreign policy. With the latter, New Delhi doesn’t know what to expect. Interestingly Reuters notes that “Modi’s office set up a six-member research group in July to help identify ways to engage with Trump.” Foreign ministries regularly game out election outcomes in partner states to have a plan regardless of how electoral contingencies play out, but that this is happening in India at the level of the Prime Ministers’ Office suggests real concern about the possibility of a Trump win in November. India has a range of reasons to be concerned and skeptical about the trajectory of burgeoning U.S.-India strategic ties under a Trump presidency, but seeing long-sought defense deals go awry would be a particularly negative outcome for New Delhi. Despite assurance from Trump advisors — such as Walid Phares, who is cited by Reuters — that nothing would change, Delhi is understandably concerned by, at best, Trump’s inconsistency on foreign policy and, at worst, his inward-looking isolationist impulses. India hasn’t come up much — if at all — on the campaign trail so far, but New Delhi wants to ensure that Washington’s enthusiasm toward continued defense cooperation persists past January 2017, regardless of a Trump or a Clinton presidency. Assurances will be difficult to attain either way, but it does appear that India is preparing for all contingencies.